Comecocos or Cootiecatchers are an opportunity to teach about and practice asking questions. 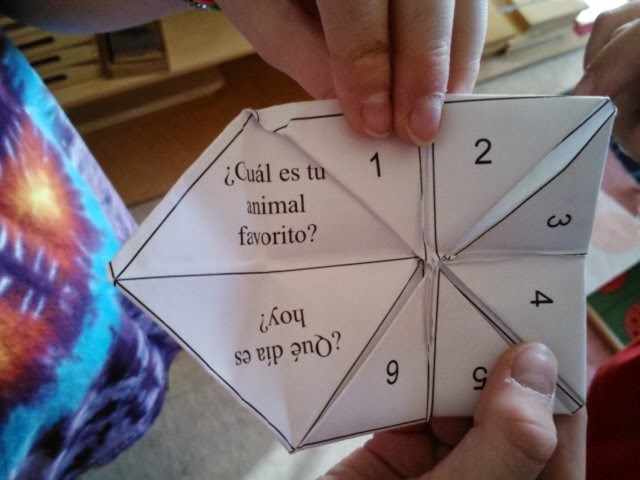 After using a pre-printed one, children can make their own using questions they've used during lessons. Ultimately, this supports children in asking questions in the context of future interpersonal interactions. Guessing games can be played in a way that ask the children to create and describe with language. Games like guess the animal or bingo can be reworked so that children are describing-above is an animal guessing game in which the 2nd graders have to describe the animal they are assigned and then read their description for the rest of the class to guess. In the past I would have played this as charades, which only asks for vocabulary recall-a very basic function. In this version, we're asking much more of them- they can and want to do it. An activity likes this is paving the way for students to be able to narrate and describe, using complete sentences. The context is a unit on the role animals play in our lives--especially pets--of high interest to young children. Everyday our elementary classes begin with community meeting ala Responsive Classroom. During this time the children gather in circle to greet each other, review the schedule for the day, hear important announcements and generally come together as a class community. This has been a rich opportunity for the Spanish program--I circulate among the classes to run at least one community meeting per week in Spanish. 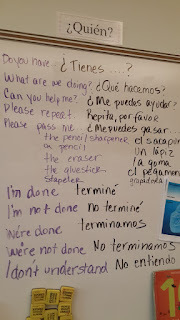 My colleagues are very much on board and have learned how to write their class schedules in Spanish(although very few of them are Spanish speakers). This has opened an opportunity for the teachers to model life long learning, as the teachers are learning right along with their students, participating in the meetings and greeting their students with their newly acquired language. During community meeting we start off by singing songs, and then always have some interpersonal time in which the children greet each other, asking questions like How are you today? What did you eat for breakfast? What are you going to do today? What do you like to do? 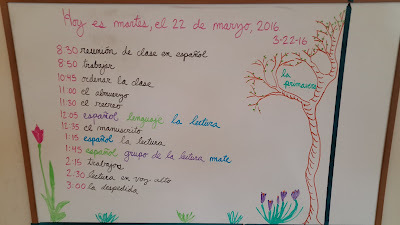 This time also focuses on what in Montessori we call Grace and Courtesy, or developing good manners--all in Spanish. Practicing interactions that require I'm sorry, Are you ok? Please excuse me? Would you like to work with me? The children are encouraged to use these during their classroom work time. Our final activity is reading and interpreting the daily schedule. This includes saying the date, and reading times and class activities. 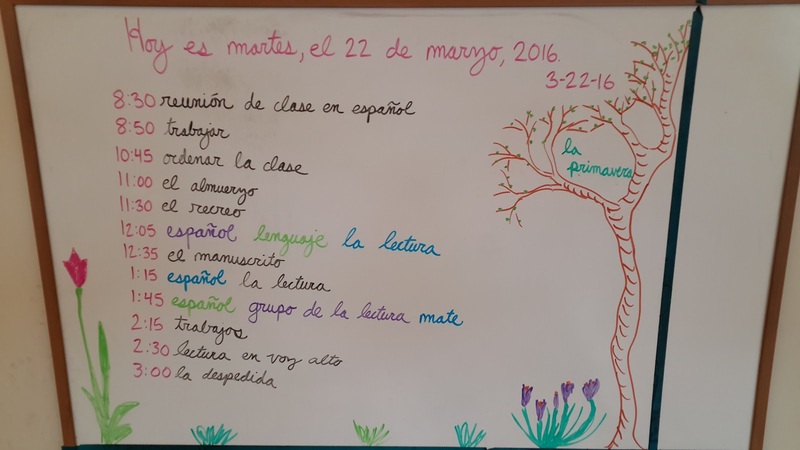 Beyond that, I ask the children to interpret asking some questions in English to see what they understand about the schedule, or what seems different from their normal routine. This activity has ended the topical units on telling time and school words. They're doing it, in context and on a real life task. 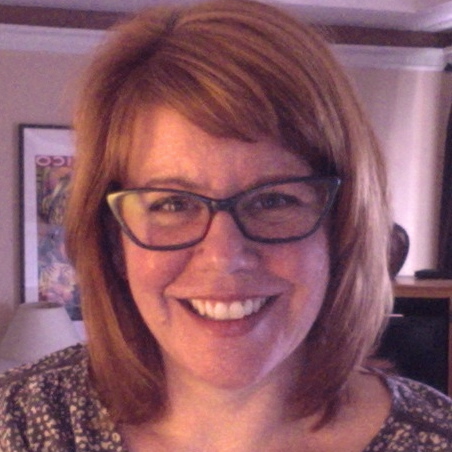 I focus on making transitions and transactions count. 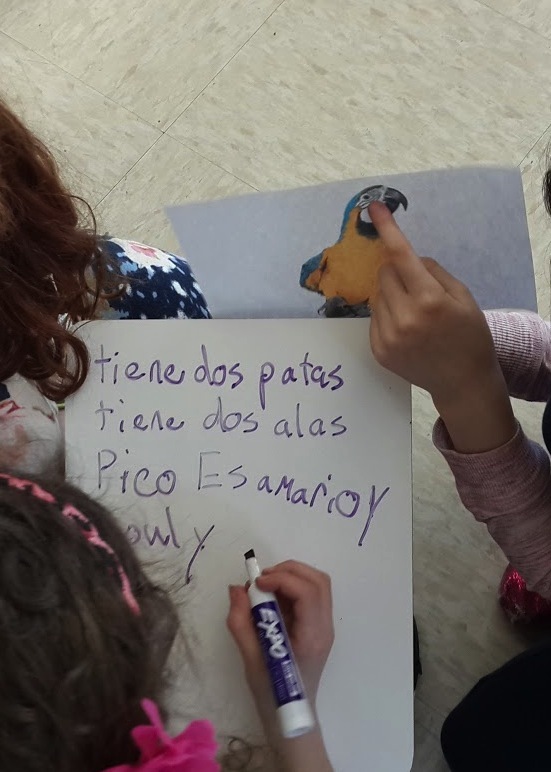 By explicitly teaching phrases that the children will need to participate in class activities, we stay in the TL and reinforce interpersonal interactions. 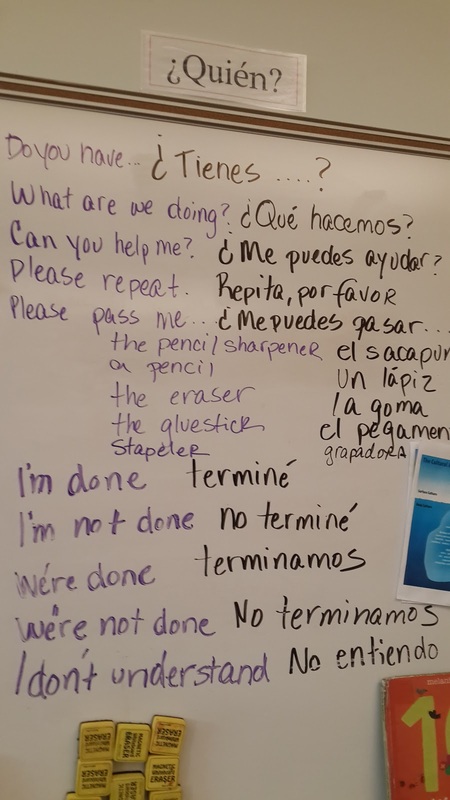 These interactions between the children are the real life part of language class-negotiating and collaborating using TL. 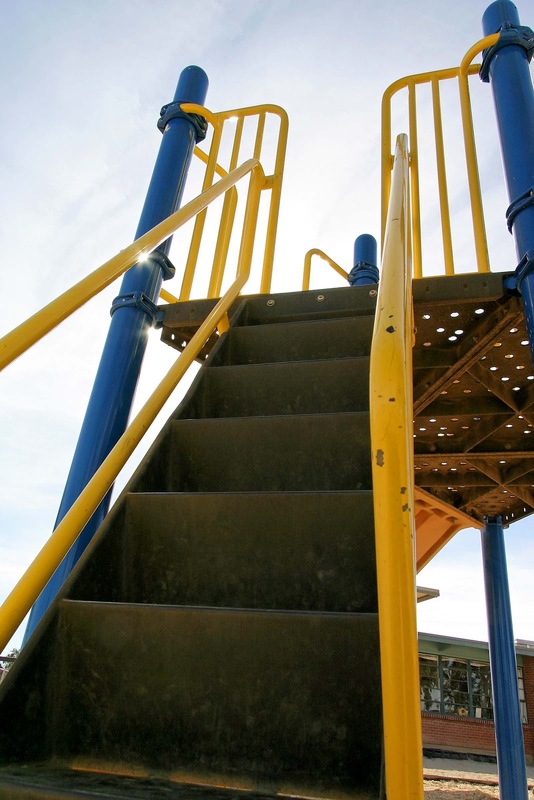 How do children in your programs navigate real life tasks, helping them to start climbing the proficiency ladder?